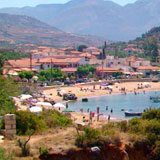 Welcome to the official website of our beautiful village in southern Greece! Here you will find all the information you need about Stoupa, including accommodation, amenities, activities, rentals and travel tips (with maps and itineraries) for visitors, as well as useful on-line resources for residents regarding general services (such as real estate and travel agencies). The website also contains information about the Mani and the Peloponnese. You can access your specific topic of interest directly from this page, using the index of contents below. We look forward to seeing you soon! If you have any comments, queries or suggestions, please e-mail us – we will reply as promptly as possible. Our website is completely virus-free, and it is updated regularly.